You are currently browsing the tag archive for the ‘Banksia Men’ tag. There was great excitement on the opening day. All the artists and other queer people went to see the pictures. When Snugglepot saw the portrait of the Banksia man it looked so real that he felt quite nervous. The great eye seemed to blink at him; he stood rooted with horror. Then suddenly the picture burst open, and out from the frame sprang the Banksia man, almost on top of him. Welcome to Children’s Literature Week. Given the purpose of this blog, a seemingly never ending endurance test undertaken so that I can stay in this wonderful country, what could be more fitting than to choose a classic Australian book? May Gibb’s enduring tale of gumnut babies and their adventures in the Bush is both beautifully told and comes with a series of wonderful illustrations. Cuddlepie is orphaned by a freak gust of wind that sweeps him away from his mother’s arms, travelling across a great distance. He is rescued from a dreary fate by a kind Nut and taken in to live with his family. In this manner the two baby Nuts, Snugglepot and Cuddlepie become foster brothers. Growing up together in the bush the two become strong and fat. May Gibb’s illustrations depict them as little cherubs running along trees and through the grass, wearing a nut-shell for a hat. One day an old Kookaburra comes to the neighbourhood and tells a story about some mysterious creatures known as Humans. The two Nuts are entranced and Snugglepot decides to steal away in the dead night to find some, even though the Kookaburra has warned them how dangerous the large beings can be. Cuddlepie is more wary and insists on observing humans from a distance. Together they travel across the bush and encounter many dangers. They make a frightening enemy in Mrs Snake, who plots with the violent Banksia men to capture and kill the Nuts. Thankfully they also meet some great friends along the way, Old Mr Lizard who always manages to pop up in the nick of time and the brave Mr Frog, as well as the other friendly creatures of the bush, such as possums and various birds. The two brothers also befriend little Ragged Blossom, a brave flower who helps rescue them from the evil Mrs Snake and afterwards becomes their closest companion. The three friends travel through the bush to the Big Bad City and even down into the depths of the sea and have many exciting adventures together. The hairy Banksia men are never far behind though and they have to contend with other villains such as deceptive tramps and a greedy John Dorry fish. Always looking out for one another, the three heroes face countless threats, kidnappings, plunges from terrible heights and undersea monsters. The book has the simple line – Ragged Blossom and Snugglepot sat very still in school and learnt of the many dangers that beset the lives of the Fish Folk. Then you look at the picture and it shows the Fish children gazing at images of hooks, nets and predatory birds. 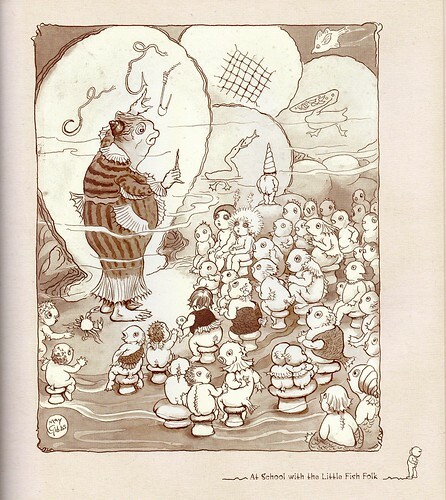 There’s even a boy with a dunce cap on in the corner and an advancing lobster about to bite the teacher’s webbed foot. It is a beautiful picture. May Gibbs book warns Australian children of some of the dangers of the bush, but also teaches them to respect and admire it. When the Nuts finally see a Human they learn that they’re not all bad and as the Old Kookaburra says, if not for the bad things in this world, there would not be good either. I enjoyed every moment of this book. I guess it speaks to the kid in me.